Aim: To determine the factors affecting mortality in patients admitted to ICU with chronic pulmonary disease. 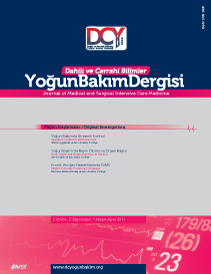 Material and Methods: Patients with chronic pulmonary disease admitted to Hacettepe University Hospital Medical ICU during the period 01.12.1999 and 31.07.2001 were included in the study. Data were obtained from the prospectively formed ICU database. Data included in the study were APACHEII score, type of pulmonary disease (KOAH, others), admission cause (pulmonary, cardiovascular, other), treatment in the ICU (medical therapy only, invasive or noninvasive mechanical ventilation), need for a tracheotomy, ICU and hospital outcome. Student t-test and chi-square test were utilised to compare hospital survivors and non-survivors. Independent factors affecting hospital mortality were determined by logistic regression analysis. Results: Of the 75 patients with chronic pulmonary disease included in the study, 54 had COPD. Hospital mortality rate was 28%. Non-survivors had significantly higher APACHE II scores (23.9±8.2, 17.4±6.0, p<0.001). For 72% of non-survivors and 85% of survivors, the reason for admission was pulmonary problems (p<0.05). Causes other than pulmonary and cardiovascular diseases for admission made up 24% in the non-survivors and 4% in the survivors (p<0.05). Eighty-one percent of the non-survivors and 33% of the survivors were treated with invasive mechanical ventilation (p<0.001). Non-invasive mechanical ventilation was used in 14% of the non-survivors, and 54% of the survivors (p<0.01). Tracheostomy was performed to 5 of the non-survivors and 1 of the survivors (p<0.01). Multivariable analysis revealed that an APACHE II score >19 and invasive mechanical ventilation in place of non-invasive mechanical ventilation were independent factors determining hospital mortality (odds ratio confidence interval, respectively are 4.7 1.3-16.4, p<0.05; 6.2 1.4-26.6, p<0.01). Conclusion: For patients admitted to an ICU with chronic pulmonary disease, an APACHEII score higher than 19 and invasive mechanical ventilation are independently associated with higher hospital mortality.